There are 3 Memory Care Facilities in the New Orleans area. To help you with your search, browse the 4 reviews below for memory care facilities in New Orleans. Better rated regions include Metairie with an average rating of 1.0 out of 5 stars. Caring.com has helped thousands of families find high-quality senior care. To speak with one of our Family Advisors about memory care options and costs in New Orleans, call (855) 863-8283. Approximately 26.4 of Louisiana's residents were diagnosed with Alzheimer’s disease in 2018, and this number is expected to increase by 26.4 percent by 2025. In New Orleans, 12.2 percent of the residents are senior citizens and those who need memory care can choose from five facilities with dedicated programs that must comply with special regulations set by the state, including specific training for employees who come into contact with patients who have dementia-related conditions. The Louisiana Department of Health oversees all adult residential care providers, including those with memory care units. Residents of these units take care when they leave their memory care facility if they have respiratory issues since New Orleans has an air quality score that is slightly below the national average. New Orleans’ score is 52, but the national average is 58. Hot summers and mild winters might appeal to memory care patients who enjoy spending time outdoors. The city doesn’t usually see snow and January lows fall to around 44 degrees. An average of 63 inches of rain falls per year. July highs soar to around 91 degrees. Hurricanes are also a consideration during the Atlantic Hurricane season. The cost of living in the Big Easy is slightly above the national average. Nationally, the overall cost of living index is 100. It is 107.5 in New Orleans. The good news for memory care residents is that the cost of health index is much lower in New Orleans with a score of only 88, so getting medical care is less expensive than the national average. The crime rate in New Orleans is markedly higher than the national average. The property crime rate in the city 49.6, but the national rate is 38.1. The violent crime rate is 71.5 for the city, which is considerably higher than the 31.1 national rate. The New Orleans area is home to world-class medical facilities, including those specializing in brain health and dementia care such as Tulane Medical Center and Oschner, in the event of medical emergencies or illness. Memory Care costs in New Orleans start around $0 per month on average, while the nationwide average cost of memory care is $4,800 per month. It’s important to note that memory care rates in New Orleans and the surrounding suburbs can vary widely based on factors such as location, the level of care needed, apartment size and the types of amenities offered at each community. New Orleans and the surrounding area are home to numerous government agencies and non-profit organizations offering help for seniors searching for or currently residing in an assisted living community. These organizations can also provide assistance in a number of other eldercare services such as geriatric care management, elder law advice, estate planning, finding home care and health and wellness programs. To see a list of free memory care resources in New Orleans, please visit our Assisted Living in Louisiana page. 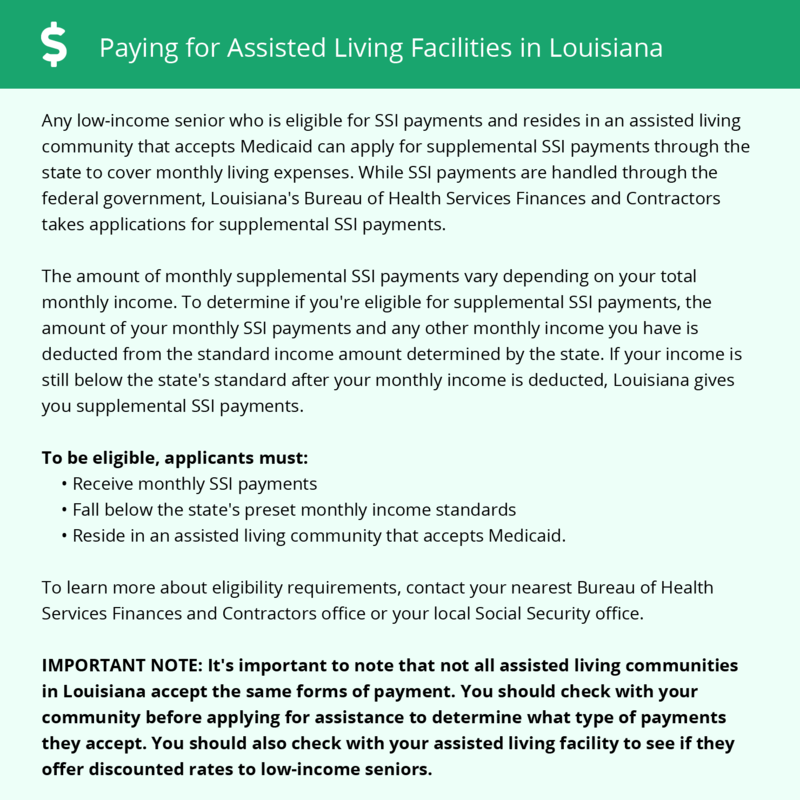 New Orleans-area assisted living communities must adhere to the comprehensive set of state laws and regulations that all assisted living communities in Louisiana are required to follow. Visit our Memory Care in Louisiana page for more information about these laws.